You will gain a foundation for college-level writing valuable for nearly any field. Students will learn how to read carefully, write effective arguments, understand the writing process, engage with others' ideas, cite accurately, and craft powerful prose. We will create a workshop environment. This subject surveys main currents of European cultural and intellectual history in the modern period. Such a foundation course is central to the humanities in Europe. The curriculum introduces a set of ideas and arguments that have played a formative role in European cultural history, and acquaints them with some exemplars of critical thought. Among the topics to be considered: the critique of religion, the promise of independence, the advance of capitalism, the temptations of Marxism, the origins of totalitarianism, and the dialects of enlightenment. In addition to texts, we will also discuss pieces of art, incl. paintings and film. The purpose of this course is to develop your writing skills so that you can feel confident writing the essays, term papers, reports, and exams you will have to produce during your career here at MIT. We will read and analyze samples of expository writing, do some work on vocabulary development, and concentrate on developing your ability to write clear, accurate, sophisticated prose. We will also deal with the grammar and mechanical problems you may have trouble with. 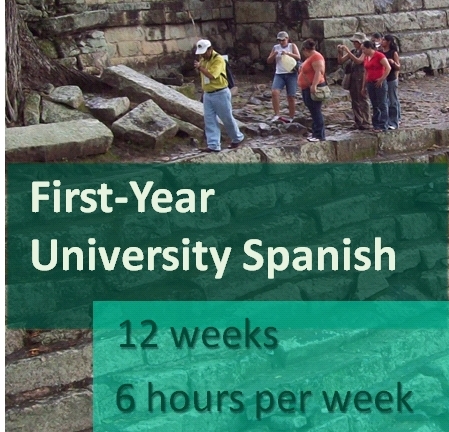 This is a 3 credit course for students with no background in Spanish to become competent in communicating through listening, speaking, reading, and writing. This open course will create and provide resources reusable under creative commons standards. Registration for the course is available immediately. Although the course cannot provide college credit from an accredited university, capable students will learn the material of a first-year college class, and will receive a letter grade. 21F.302/352 is the second part of an introductory course to the French language and culture with an emphasis on the acquisition of vocabulary and grammatical concepts through active communication. The course is conducted entirely in French and students interact in French with their classmates from the very beginning. They also receive exposure to the language via a variety of authentic sources such as the Internet, audio, video and printed materials which help them develop cultural awareness as well as linguistic proficiency. There is a coordinated language lab program. This course provides an introduction to general semantics—the study of how we transform our life experiences into language and thought. Students will learn how their language habits and behaviors, as well as how they think about and share experiences, are what make them uniquely human. In other words, students will discover the critical, but sometimes subtle distinctions between what happens in their lives and how they talk about what happens. The course will include readings from a wide array of disciplines, such as communication studies, neuroscience, and cultural anthropology. It will also include visual and auditory demonstrations through music and social media, and collaborative interactions with fellow learners. These types of learning experiences allow students to not only learn about more effective language behaviors, but also practice those new behaviors in order to communicate more effectively and appropriately in interpersonal and organizational contexts. The topic for Fall 2006 is short film and radio plays. This course investigates current trends and topics in German literary, theater, film, television, radio, and other media arts productions. Students analyze media texts in the context of their production, reception, and distribution as well as the public debates initiated by these works. The topic for Fall 2006 is German Short Film, a popular format that represents most recent trends in film production, and German Radio Art, a striving genre that includes experimental radio plays, sound art, and audio installations. Special attention will be given to the representation of German minorities, contrasted by their own artistic expressions reflecting changes in identity and a new political voice. Students have the opportunity to discuss course topics with a writer, filmmaker, and/or media artist from Germany. The course is taught in German. This course expands skills in speaking, reading, listening, and writing. Students develop analytic and interpretative skills through the reading of a full-length drama as well as short prose and poetry (Biermann, Brecht, Dürrenmatt, Tawada and others) and through media selections on contemporary issues in German-speaking cultures. Coursework includes discussions and compositions based on these texts, and review of grammar and development of vocabulary-building strategies. It is recommended for students with two years of high school German. This course focuses on main currents in contemporary German literary and visual culture. Taking Nietzsche's thought as a point of departure, students will survey the dialectics of tradition and modernity in both Germany and other European countries, particularly the UK, France, Denmark, and Poland. Primary works are drawn from literature, cinema, art, and performance, including works by Peter Sloterdijk, Thomas Vinterberg, and Michel Houellebecq. This subject examines the paradoxes of contemporary globalization. Through lectures, discussions and student presentations, we will study the cultural, linguistic, social and political impact of globalization across broad international borders and on specific language communities. We will consider answers to key questions such as: What are the contending definitions of globalization? What are the principal agents of change? How have those agents of change been transformed in our contemporary world? What's new, what's hybrid, and what's traditional? What does it mean to be a world citizen? How can world citizens preserve cultural specificity?